Despite her mother's election loss, Chelsea Clinton is still hopeful about the future of politics. As her mother serves as a December guest editor for Teen Vogue, the activist and mom of two penned a letter to her children reflecting on the presidential election, looking forward, and calling out President Trump's less-than-honorable character traits. In the letter, which Teen Vogue published on Tuesday, Clinton addressed her children, Charlotte and Aidan, sharing why her efforts in the 2016 election campaign were so meaningful. "For me, the 2016 Election was most of all about you and the world I wanted for you and your generation to grow up in," Clinton wrote. "While your grandmother’s name was on the ballot, for me, it was an election fundamentally about our country’s future, about your future." The former first daughter went on to remind her children how lucky they are, calling attention to key issues the world is facing like healthcare, racism, and the water crisis in Flint, Michigan. Issues, she notes, her mother was working to improve. Chelsea Clinton practices her role as the Favorite Aunt in the Washington Ballet's production of the Christmas classic, 'The Nutcracker' at the Warner Theatre in Washington Wednesday, Dec. 7, 1994. The show will open later in December at the Warner Theatre in downtown Washington. Chelsea Clinton poses backstage at the Glamour Magazine 2010 Women of the Year Gala at Carnegie Hall on November 8, 2010 in New York City. THE TONIGHT SHOW STARRING JIMMY FALLON -- Episode 0024 -- Pictured: (l-r) Chelsea Clinton during an interview with host Jimmy Fallon on March 20, 2014 -- (Photo by: Lloyd Bishop/NBC)..
"...You do not know what it is like to be hungry, to be homeless, to not have health care, to not have books to read, to not have a safe place to play in, to not know if your parents may be taken away in the night, to not have safe drinking water," she wrote. "You will not have to worry about whether you may be shot because of your skin color colliding with generations of racist rot." Clinton told her children that as they grow up she will have important discussions with them about the 2016 election, explaining everything from emails to "deplorables." Then, holding nothing back, she delved into the differences between her mother and President Trump. 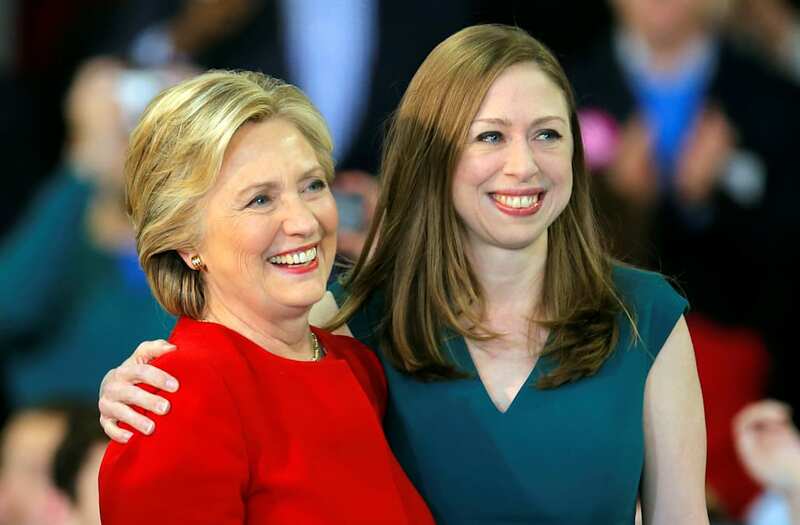 "She spoke about all she hoped and planned to do to lift up everyone’s lives and opportunities," Clinton said, describing her mother's campaign process. "Then she talked about people with racist, sexist, xenophobic, homophobic views that then-candidate Trump emboldened and validated." "In 2016, your grandmother was equally fighting for the people who agreed with her and those who didn’t — but she wasn’t afraid to call out bigoted views for what they were," Clinton said, noting she had "repeatedly called out then-candidate Trump and others for their hate speech" while on the campaign trail. If anything, Clinton said President Trump’s administration has shown how much elections matter. "We have a president who excuses neo-Nazis, who wants to ban members of our military because of who they are and keep out immigrants because of who they worship," she wrote. "We have a president who denies science, whether it’s vaccines or climate change or evidence that, yes, health insurance helps save lives; that’s personal, too, because it’s about protecting our public health today and in the future. The marked rise in bullying in our schools, with some kids citing President Trump’s words to taunt others? That’s personal, too." Despite the tough year, Clinton ended her letter on a hopeful note, sharing she's more inspired than ever to fight for what she believes is right. "Everything that motivated me to work so hard for your futures throughout 2016 is still true today. Arguably more so."